Working with the wrong accounting classifications can lead to wrong conclusions in any area of economics. But it is especially treacherous in international finance, due to the importance of key currencies and the operations of multinational firms, especially global banks. Much of the analysis in international finance is still conducted under the assumption that the GDP area, decision-making unit and the currency area coincide – the so-called ‘triple coincidence’. This column illustrates the common analytical missteps that can arise by reviewing three examples from the recent past, and argues that a proper analysis of capital flows necessitates paying greater attention to basic accounting building blocks. Capital flows are traditionally viewed as the financial counterpart to savings and investment decisions. In textbooks, the unit of analysis is the national GDP area, and what is ‘external’ or ‘internal’ is defined with reference to its boundaries (e.g. Krugman et al. 2012, Obstfeld and Rogoff 1996). This perspective naturally leads to a focus on net capital flows between countries, and the current account indicates the borrowing requirement of the country as a whole. Textbooks typically add two further features which appear innocuous but turn out to be hugely consequential for the conclusions. The first assumes that all sectors in the economy (firms, households, government) can be summed into one representative decision-maker. The second is that each economic area has its own currency and that currency is primarily used in that economic area. The upshot of these two additional assumptions is a ‘triple coincidence’ between: (1) the economic area defined by the GDP boundary; (2) the decision-making unit; and (3) the currency area. No doubt, this is an elegant simplification for analytical purposes. However, as we argue in a paper presented at last October’s Economic Policy panel, and published recently, the assumption of the triple coincidence can mislead in a world of multinational firms and international currencies in which financial flows are important in their own right (Avdjiev et al. 2016). Consider three examples of how the triple coincidence can mislead. The first example is cross-border banking and the subprime mortgage crisis in the US. Bernanke (2005) famously coined the term ‘global saving glut’ to explain how the large US current account deficit could coexist with easy US financial conditions during the run-up to the financial crisis. In line with the triple coincidence, Bernanke attributed these to excess saving in emerging economies combined with their preference for US financial assets. In the event, however, emerging market investors were not the ones to bear the big losses from subprime mortgage securities. Instead, it was European investors, notably the banks, which took the hit. McGuire and Von Peter (2012) and Shin (2012) showed how European banks funded subprime portfolios by the ‘round-tripping’ of dollar funds from the US and back again. The dollars raised by borrowing from US money market funds flowed back to the United States through purchases of securities built on subprime mortgages (Figure 1). Since the outflows to Europe were matched by the inflows from Europe, the changes in net flows were negligible, so that these flows were virtually invisible to someone who looked only at the current account balance. Notes: The thickness of the arrows indicates the size of the outstanding stock of claims. The direction of the arrows indicates the direction of the claims: arrows directed from region A to region B indicate lending from banks located in region A to borrowers located in region B. Source: BIS locational banking statistics. Europe’s current account remained broadly in balance, even though its gross capital flows vis-à-vis the US grew enormously, funding the rapid increase in credit to subprime borrowers. Gross flows matter, not just net flows.1 The triple coincidence misleads, because it obscures gross flows. The second example of how the triple coincidence can mislead is in discussions of exchange rate adjustments implied by current account imbalances for countries whose national currency is widely used internationally. In the event, the US dollar rose sharply with the onset of the crisis in 2008. Its strong appreciation was associated with the deleveraging of the European banks mentioned above, who had used short-term dollar funding to invest in risky long-term dollar assets. As the crisis erupted and risky US mortgage bonds fell in value, these banks found they had dollar liabilities which exceeded their depreciating dollar assets. They were stampeded into bidding aggressively for dollars to repay their dollar debt, pushing up the dollar’s value further, piling on further pressure on their balance sheets. The triple coincidence misleads in that it gives insufficient weight to international funding currencies that are extensively borrowed outside the borders of their home countries. Indeed, the neglect of international currencies in Krugman (2007) stands in contrast to Krugman (1999), in which he told the story of the Asian financial crisis in terms of the dollar debt of Asian firms. The lesson is thus that international currencies matter for the transmission of financial conditions. The sharp rise in the dollar since mid-2014 brings us back full circle to events happening right now. In the meanwhile, the protagonists have changed. Rather than European banks buying subprime mortgage securities, the dollar borrowers are emerging market firms and global banks that provide currency hedging to pension funds and insurance companies. In the case of emerging market firms borrowing dollars, an oft-heard argument is that if the companies hail from countries with current account surpluses, the financial stability risks are minimal. This argument falls foul of the third example of when triple coincidence reasoning misleads. The third example of how the triple coincidence can mislead is when the aggregation assumption is violated. Take the case of Korea in 2008. Korea was running a current account surplus in 2008. Moreover, its lending to foreigners exceeded its borrowing from foreigners. What is more, dollar appreciation in 2008 actually increased Korea’s net international wealth.4 Nevertheless, Korea was one of the countries worst hit by the 2008 crisis, with GDP growth slowing sharply in 2009. Why was this? A closer look at the sectoral decomposition of the international investment position sheds light on why Korea was hit so hard in 2009. Although Korea had a positive net external asset position vis-à-vis the rest of the world when balance sheets were summed across all sectors, including the official sector, there was considerable disparity across sectors. In particular, the corporate sector had large net debts vis-à-vis the rest of the world, as depicted in Krugman (1999). Korean firms’ negative net position mattered more for economic growth than the net positive investment position of the official sector, with its sizeable foreign exchange reserves. Unless there is some automatic mechanism to transfer the exchange-rate gains on official reserves to distressed non-financial firms – an ‘immaculate transfer’, to borrow a phrase5 – they will need to adjust their spending and hiring, hitting domestic economic activity directly. The capital gains seen on the central bank balance sheet will not help the corporate borrowers who face a surge in the dollar’s value and a resulting bank credit crunch. Thus the triple coincidence misleads if it glosses over the relevant decision-making unit by aggregating too much. However, many key decision-making units straddle the GDP boundary, so that the triple coincidence draws the boundary in the wrong place altogether (Borio et al. 2014, Fender and McGuire 2010). This last point is especially important at the time of writing, given the large stock of dollar-denominated debt of emerging market firms owed by their offshore affiliates. Thus, the failure of the triple coincidence matters not only in retrospect, but it is likely to matter in the future. Indeed, gross flows, global currencies and sectoral disparities may well be more important than ever. McCauley et al. (2015a,b) estimated that the US dollar-denominated debt of non-banks outside the US stood at $9.8 trillion as of June 2015. Of this total, more than 70% involved no direct lender in the US. These facts highlight the important role of international currencies and the role of the US dollar, in particular, as the funding currency of choice among borrowers outside the US. Underscoring the sectoral disparities, the component of US dollar debt outside the US that has grown the fastest has been taken on by emerging market firms. Just as Korea experienced in 2008, dollar appreciation can slow corporate spending and hiring, slowing growth, even if the corporate borrowers are headquartered in countries with large foreign exchange reserves. Post-crisis, there has been a growing recognition that it may no longer be enough to build the analytical framework of international finance purely around savings and investment decisions. In his Ely lecture at the 2012 American Economic Association meeting, Obstfeld (2012, p. 3) concludes that “large gross financial flows entail potential stability risks that may be only distantly related, if related at all, to the global configuration of saving-investment discrepancies” (see also Borio and Disyatat 2011, 2015). Nevertheless, challenges lie ahead when we seek to move from a recognition of the inadequacy of our current accounting classifications towards a workable general equilibrium framework that transcends the triple coincidence. General equilibrium models deal with GDP components such as consumption and investment, and hence start with the GDP area as the unit of analysis. However, financial flows and balance sheets often do not map neatly on to the traditional macro variables that are measured within the GDP boundary. To make progress, we can go in one of two directions. The first is to drill down to individual firms and households, using micro data. The second is to go in the opposite direction, and ‘drill up’ to use aggregate global data. The rationale for the second strategy is that if we focus on global categories, such as global financial conditions or global appetite for risk, the lack of coincidence between the GDP areas and balance sheets matters less. At the global level, the numbers all add up to the same global total. 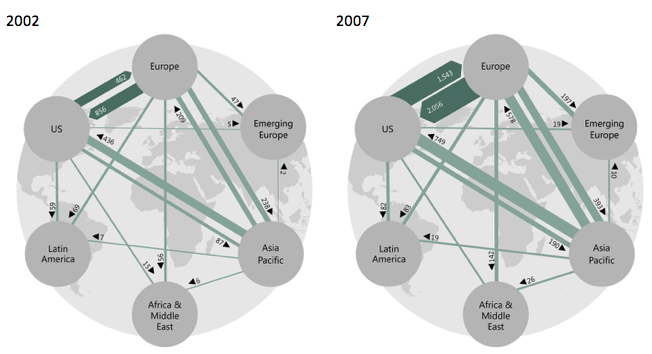 Bruno and Shin (2015) is an example of how the global banking system can be analysed in just such a global model, and Cohen et al. (2016) explain how the BIS Global Liquidity Indicators can be motivated as indicators of global conditions. Banerjee, R., M. Devereux and G. Lombardo (2016), “Self-oriented monetary policy, global ﬁnancial markets and excess volatility of international capital ﬂows”, Journal of International Money and Finance. Bernanke, B. (2005), “The global saving glut and the U.S. current account deﬁcit”, remarks at the Sandridge Lecture, Virginia Association of Economists, Richmond, VA.
Borio, C. and P. Disyatat (2011), “Global imbalances and the ﬁnancial crisis: link or no link?”, BIS Working Paper No. 346. Borio, C. and P. Disyatat (2015), “Capital ﬂows and the current account: taking ﬁnancing (more) seriously”, BIS Working Paper No. 525. Borio, C., H. James and H. S. Shin (2014), “The international monetary and ﬁnancial system: a capital account historical perspective”, BIS Working Paper No. 457. Bruno, V. and H. S. Shin (2015), “Cross-border banking and global liquidity” Review of Economic Studies 82(2): 535-564. Cohen, B., D. Domanski, I. Fender and H. S. Shin (2016), “Global liquidity: a selective survey”, paper prepared for the Annual Review of Economics. Dedola, L. and G. Lombardo (2012), “Financial frictions, ﬁnancial integration and the international propagation of shocks”, Economic Policy 27: 319–59. Dedola, L., P. Karadi and G. Lombardo (2013), “Global implications of national unconventional policies”, Journal of Monetary Economics 60: 66–85. Edwards, S. (2005), “Is the U.S. current account deﬁcit sustainable? If not, how costly is adjustment likely to be?”, Brookings Papers on Economic Activity 1: 211–88. Fender, I. and P. McGuire (2010), “Bank structure, funding risk and the transmission of shocks across countries: concepts and measurement”, BIS Quarterly Review, 63–79. Gourinchas, P.-O. and H. Rey (2014), “External adjustment, global imbalances, valuation effects”, in G. Gopinath, E. Helpman and K. Rogoff (eds), Handbook of International Economics, vol. 4, Amsterdam: North Holland, pp. 585–646. Kollman, R., Z. Enders and G. Müller (2011), “Global banking and international business cycles”, European Economic Review 55: 407–26. Krugman, P. (1999), “Balance sheets, the transfer problem, and ﬁnancial crises”, in P. Isard, A. Razin and A. Rose (eds), International Finance and Financial Crises, Washington, DC and Boston: IMF and Kluwer, pp. 31–55. Krugman, P. (2007), “Will there be a dollar crisis”, Economic Policy 22: 436–67. Krugman, P., M. Obstfeld and M. Melitz (2012), International economics: theory and policy, Pearson. Lane, P. and J. Shambaugh (2010a), “Financial exchange rates and international currency exposures”, American Economic Review 100: 518–40. Lane, P. and J. Shambaugh (2010b), “The long or short of it: determinants of foreign currency exposure in external balance sheets”, Journal of International Economics 80: 33–44. McCauley, R., P. McGuire and V. Sushko (2015a), “Global dollar credit: links to US monetary policy and leverage”, Economic Policy 30: 187–229. McCauley, R., P. McGuire and V. Sushko (2015b), “Dollar credit to emerging market economies”, BIS Quarterly Review, 27–41. McGuire, P. and G. von Peter (2012), “The US dollar shortage in global banking and the international policy response”, International Finance 15: 155–78. Obstfeld, M. (2012), “Does the current account still matter?”, American Economic Review Papers & Proceedings 102: 1–23. Obstfeld, M. and K. Rogoff (1996), Foundations of International Macroeconomics, Cambridge, MA: MIT Press. Obstfeld, M. and K. Rogoff (2005), “Global current account imbalances and exchange rate adjustments”, Brookings Papers on Economic Activity 1: 67–123. Setser, B. and N. Roubini (2005), “Our money, our debt, our problem”, Foreign Affairs 84: 194–8. Shin H. S. (2012) “Global banking glut and the loan risk premium” 2011 Mundell-Fleming Lecture, IMF Economic Review 60: 155-192. Summers, L. (2004), “The US current account deﬁcit and the global economy”, Per Jacobsson Lecture, International Monetary Fund. Tille, C. (2003), “The impact of exchange rate movements on US foreign debt”, Current Issues in Economics and Finance 9, Federal Reserve Bank of New York. Ueda, K. (2012), “Banking globalization and international business cycles: cross-border chained credit contracts and ﬁnancial accelerators”, Journal of International Economics 86: 1–16. The recognition of the importance of gross capital flows has been an important theme of the recent work in international finance. See Gourinchas and Rey (2014), Lane and Shambaugh (2010a,b) and Bénétrix et al. (2015). Wile E Coyote is a hapless cartoon character who is apt to run off cliffs and then hover in mid-air until he looks down and realizes that there is nothing to support him below. He then crashes to the ground after a plaintive look to the viewer (see https://en.wikipedia.org/wiki/Wile_E._Coyote_and_The_ Road_Runner). "Is this the Wile E. Coyote moment? ", http://krugman.blogs.nytimes.com/2007/09/20/is-this-the- wile-e-coyote-moment/. See also the related blog post "Robert Rubin is wrong about the dollar", http://krugman.blogs.nytimes.com/2007/11/10/robert-rubin-is-wrong-about-the-dollar/. Tille (2003) showed that dollar appreciation conversely boosts US net international liabilities because US residents have dollar-denominated liabilities to the rest of the world that exceed their corresponding assets.